We see it every day, but we do not notice it very often. We used to see it draped on the shoulders of our grandfathers. Our grandmothers and mothers would tie it around their wet tresses after a shower every day. This garment is flamboyant and fabulous. It is the magnificent gamchha, and not just any small piece of hand woven material. With its vibrant look, every piece has a story to tell. The story of gamchha, in one way or another, has always been intertwined with the lives of the destitute. It has always been a necessary piece of clothing for the poor. Farmers, rickshaw pullers, day labourers and others impoverished like them never leave home without tossing one over their shoulders. The gamchha has been around for hundreds of years as a part of our heritage, one that is slowly fading away but still struggling resolutely for survival. The mainstream masses have learned to appreciate its beauty only recently. The gamchha is a fashion statement for young people these days. Trendy gamchha saris, or shalwar-kamiz, fatuas, jhola bags, and caps made with gamchha are all the rage. 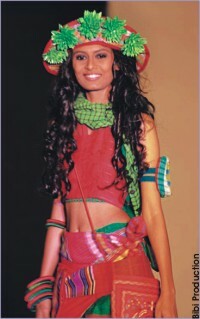 The flashy colours of gamchha have begun to fascinate the young fashion designers of the country. Efforts are on the way to revive this age-old cottage industry. The gamchha industry exists in every district of Bangladesh. However, there are four dominating areas in the country famous for their gamchha industry and trade. Baburhaat of Norshingdi, Shahjadpur haat in Sirajganj, Kumarkhali in Kushtia and Gouronodi of Barisal are widely known for their colourful gamchha. If looked at with no particular care, the gamchha appears to be an ordinary fabric with only chequered patterns and a combination of two colours. Yet, if we notice carefully, gamchhas produced in every locality vary in size, colour and patterns. For instance, a gamchha made in Jhalakathi has a greenish base with large checks. Large checks mean that they are comparatively easy make and are sold cheap. Gamchha makers of Shirajganj are fond of the reddish end of the colour spectrum. The same combinations prevail in the Sonargaon area. Gamchhas made in Kushtia in their half-inch chequered patterns have four or five colours. In Barisal they use red, and the pattern is called 'jhuri' check (tiny condensed checks). Gamchhas found in Kumarkhali and Rajshahi are large in size, and weavers in this area prefer shades of red, blue and yellow. 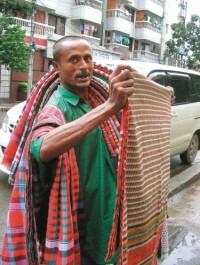 At Kumarkhali, they make 'dobi' gamchha, which is thick in texture, and these are the only gamchas that come in striped patterns rather than chequered. Interestingly enough, one will never find a gamchha in a black and white combination or with a black and white base in the Bangali locality. However, indigenous people, both in the hills and plain lands, widely use black and white. The texture of gamchhas made in the hills is thick, as they use rayon and it has small checks or dots. Gamchhas made by the Monipuris in the Sylhet region are very large in size with thin borders. Small checks also prevail in their patterns. Monipuri gamchha makers love white and blue. The gamchha has never been the centre of much attention amongst the average Bangali people, yet there are a few who manage to make a great fashion statement with this piece of cloth. We all heard about Bibi Russell who rocked the fashion scene all the way in Europe with her bold gamchha line up. "When I visited my village during childhood, I notice the bright piece of cloth that people always carried with them; it always attracted me" says Bibi. "I used to experiment with colours and always had the gamchha's vibrant combination in my mind" she added. Bibi studied fashion at the London College of Fashion in 1972. Even then, like her country folks, she carried a gamchha on her shoulder. In her first collection she introduced the gamchha to the well off segment of the society. It was a hit, and since then, it has become the signature of Bangladesh's heritage in other parts of the world. Bibi is currently working with gamchha tatis in all the districts of Bangladesh except Barisal. Bibi explains that her production does not alter the traditional patterns, but she sometimes modifies the texture and colour. She stressed the need for creating diversified gamchha products. Bibi makes bags, caps, skirts, tops, saris and much more, all with the gamchha fabric. In fact, she was the first person to experiment with the gamchha sari. "Diversity will help the product to survive", she relates. Bibi thinks the gamchha can be used in style for various purposes. One just needs to know how. One can make tablecloths, cushion covers, and replace towels in the bathroom or even use it as table napkin for guests. "Our boutique shop can easily promote gamccha production by producing these products" she states. Bibi also points out "Our Muktijoddho has a close bond with this fabric. Photos taken at that period show that every Muktijoddha had a gamchha with them, either tied to their rifles or around their heads". Remembering this, Bibi pays special tribute to the gamchha for its contribution. The works of our craftsmen have always inspired Prabartana. Prabartana started their journey in the year 1989. Since the beginning they have close ties with the weavers. The objective of their relentless efforts is to promote their works. Shahid Hussain Shamim, Director of Prabartana tells us, "After the flood in 2004 the lives of the tatis has become even more miserable. We tried to help them by creating work and selling their products, and now, our involvement with the tati community has extended to a greater level." Prabartana distributed gamchha and gamchha products as souvenirs during several of their workshops and seminars. "The general idea behind the effort was to introduce it to the urbane segment and create work for the tatis", says Shamim. They currently have around thousand gamchha tatis working with them. They are working with the tatis of Sonargaon, Shirajganj, Jhalakathi, Barisal and some other districts. Tatis remain out of work for about 9 months of the year. Shamim believes that the best way to help them is by creating work during the off-season period and by attracting more customers especially the middle class. It will increase sale and the tatis will eventually stay busy all through the year. "In the future we want to explore more in this field, create work for the tatis and produce better quality gamchhas." Shamim also mentions, "One of our recent initiative of creating work for gamchha tatis is to design black and white gamccha". "Black and white is always trendy and popular among the young generation", he relates. He hopes to capture them with this new product. Like the gamchha itself the makers of this splendid fabric have a story to tell. Among all the sectors of handloom industry, gamchha is the most neglected. All around Bangladesh, gamchha tatis are leading a miserable life. For an expert tati, it takes about 90 minutes to produce one spread (thaan) of gamchha. A spread contains several gamchha. In a week, s/he can produce 10 to 12 spreads. Their work is backbreaking, in return they get too little. The production cost is too high these days in comparison to the price of their products. A tati earns around tk350 to tk450 in a week. Their income is gradually decreasing. Cheap towels are gradually taking over. There was a time when tatis only worked at their family handloom, maintaining family heritage. Each family used to own at least five or six handlooms. Nowadays the number has reduced to one. The peak season for gamchha production is during the month of Chaitra, Baishakh and Jaishtha, during the summer. The rest of the year, their handloom remains idle so they have no income for rest of the year. To support their families, most gamchha tatis now have to maintain more than one income generating activity. Many tatis work as rickshaw pullers or farmers during the off-season. Many tatis have even changed their occupation to survive. Children in the tati family used to and still perform pre-production chores. The new generation these days are choosing different professions, not choosing to follow the profession of their forefathers. Most tatis do not let their offspring follow their footsteps any more. Jhalakathi was once renowned for its wonderful gamchhas. Gani Miah of Bashonda, Jhalokathi, is a pioneer of this area for his good quality gamchha. He sold his products in all the busy haats of the country during his best days. Today, at the age of 70, he owns only two taats and like all the other tatis, he did not allow his children to become a gamchha tati. Gani Miah is happy that instead of becoming an ill-fated tati like himself, his sons work as hawkers at Gulistan. that Potua Kamrul Hassan was the first person to put gamchha in the limelight? The artist's imagination easily captured the beauty of this vivid material. During the 80s Kamrul Hassan made fatuas with gamchha. He even appeared in TV shows wearing one of his bright gamchha fatua. In the rural area, there was a tradition among Hindu families of using a small gamchha during puja. This particular gamchha, called thakurer gamchha, was used for distributing prashad (food offering to the deity, later taken by the devotees) and performing puja rituals. In the rural area, Ojhas (local shamans) capture venomous snakes during the reproductive season. Later, they play with the snake with a gamchha. The riled up snake tries to attack the gamchha in a fit of rage, leaving its venom on the fabric. It is widely believed in rural areas that this gamchha has special healing powers. They believe it can treat people with snakebites, and ojhas use it widely, declaring it to be powerful.